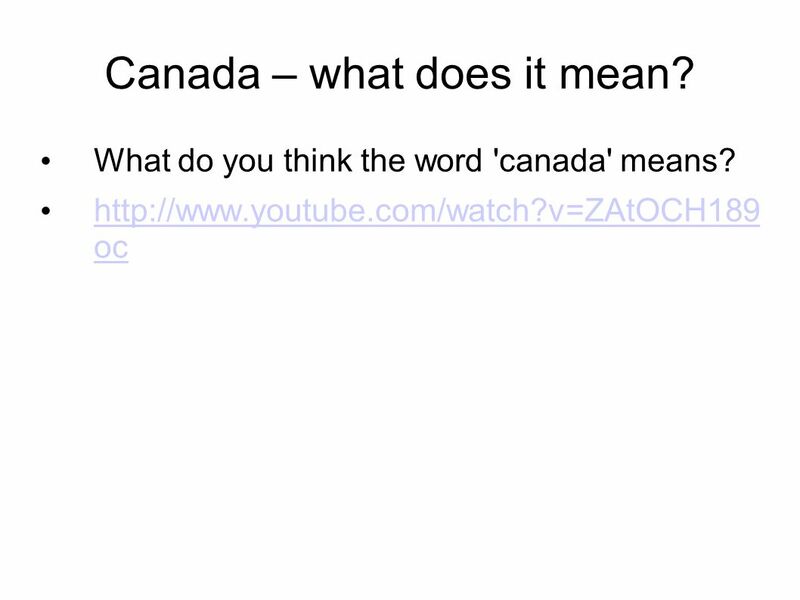 2 Canada – what does it mean? 5 Contact! 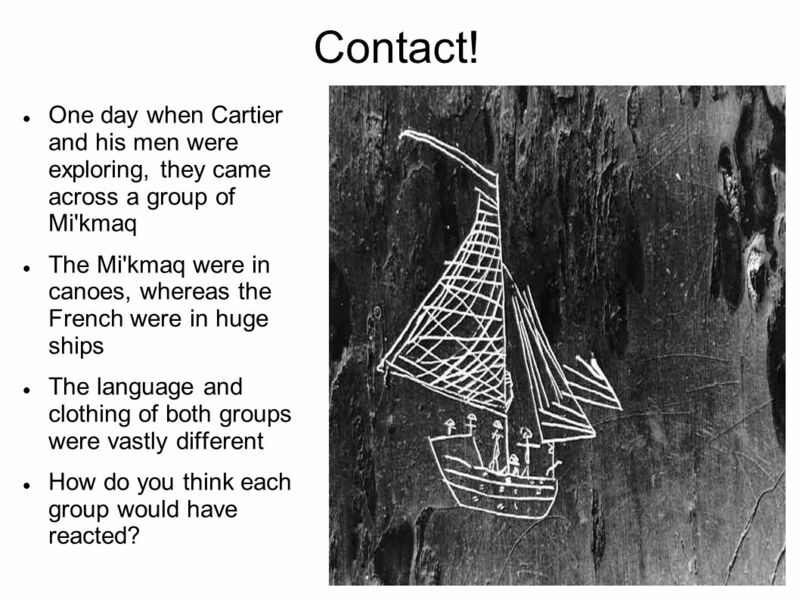 One day when Cartier and his men were exploring, they came across a group of Mi'kmaq The Mi'kmaq were in canoes, whereas the French were in huge ships The language and clothing of both groups were vastly different How do you think each group would have reacted? 6 SOAPSTone! 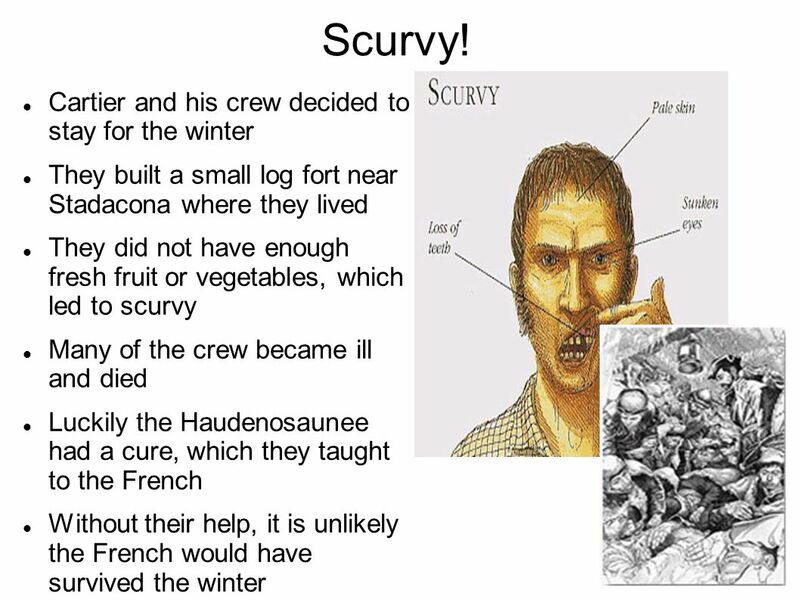 We will read the primary source together and discuss some of the following questions. 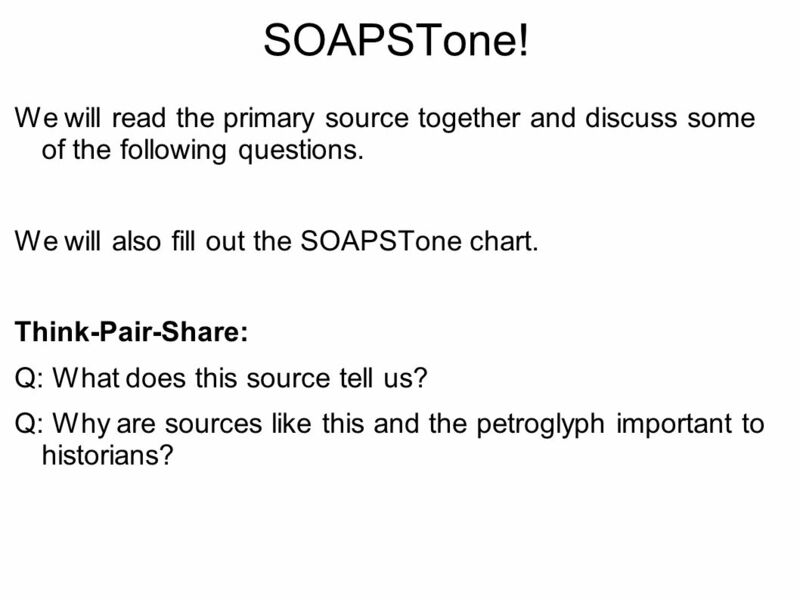 We will also fill out the SOAPSTone chart. Think-Pair-Share: Q: What does this source tell us? Q: Why are sources like this and the petroglyph important to historians? 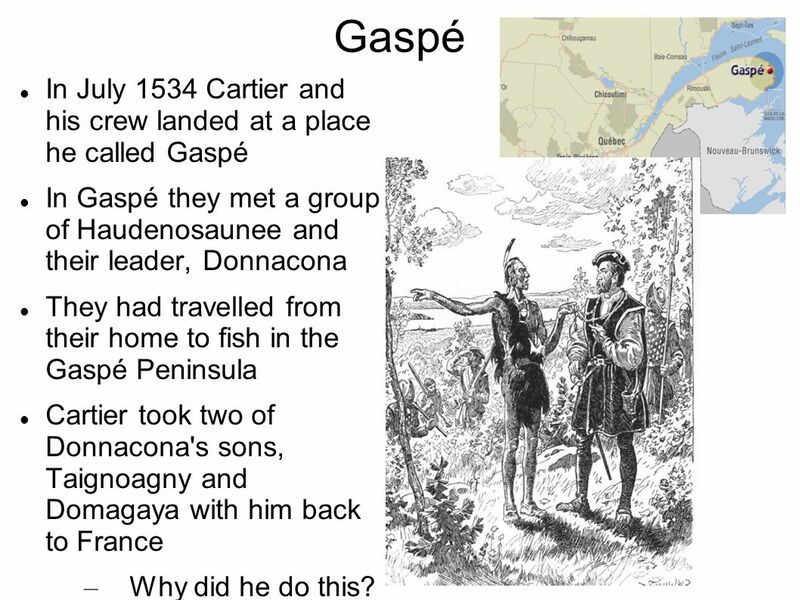 7 Gaspé In July 1534 Cartier and his crew landed at a place he called Gaspé In Gaspé they met a group of Haudenosaunee and their leader, Donnacona They had travelled from their home to fish in the Gaspé Peninsula Cartier took two of Donnacona's sons, Taignoagny and Domagaya with him back to France Why did he do this? 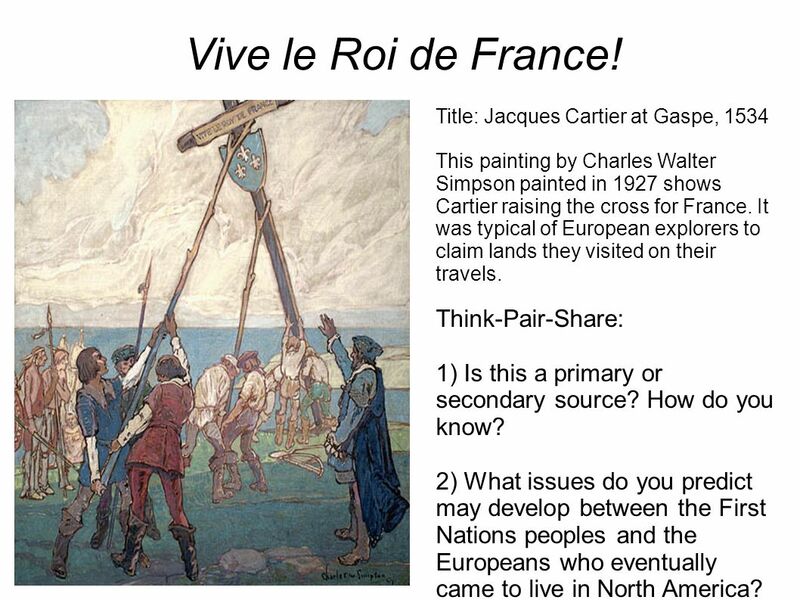 Title: Jacques Cartier at Gaspe, 1534 This painting by Charles Walter Simpson painted in 1927 shows Cartier raising the cross for France. It was typical of European explorers to claim lands they visited on their travels. Think-Pair-Share: 1) Is this a primary or secondary source? How do you know? 2) What issues do you predict may develop between the First Nations peoples and the Europeans who eventually came to live in North America? 9 Donnacona's Reaction “When we had returned to our ships, the captain [Donnacona], dressed in an old black bear skin, arrived in a canoe with three of his sons and his brother Pointing to the cross, he made us a long harangue, making the sign of the cross with his two fingers; and then he pointed to the land all around, as if to say that all this belonged to him, and that we ought not to have set up this cross without his permission.” Q: What do you think of this speech? Who do you agree with? Why? Q: What vocab word is Cartier exhibiting? 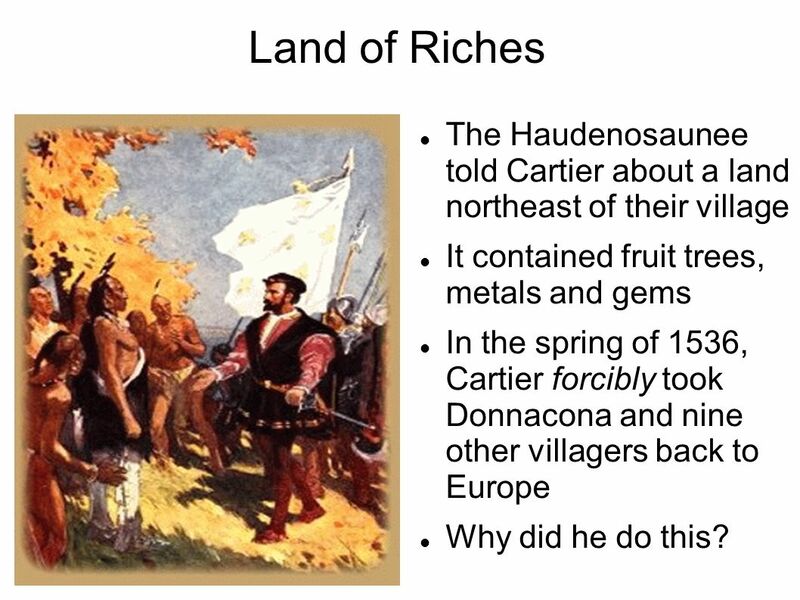 12 Land of Riches The Haudenosaunee told Cartier about a land northeast of their village It contained fruit trees, metals and gems In the spring of 1536, Cartier forcibly took Donnacona and nine other villagers back to Europe Why did he do this? 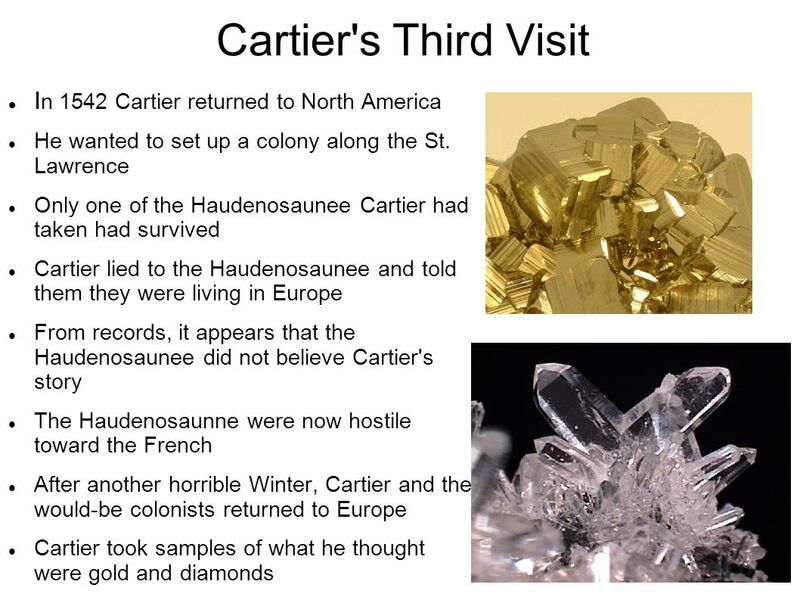 Option 1: Why was Cartier's exploration in North America important for France? Create a web diagram to illustrate your answer. Should have at least three main points with added details Option 2: Take on the role of Cartier as he raised the cross at Gaspé. Write a diary entry from his perspective on why he felt justified in raising it. 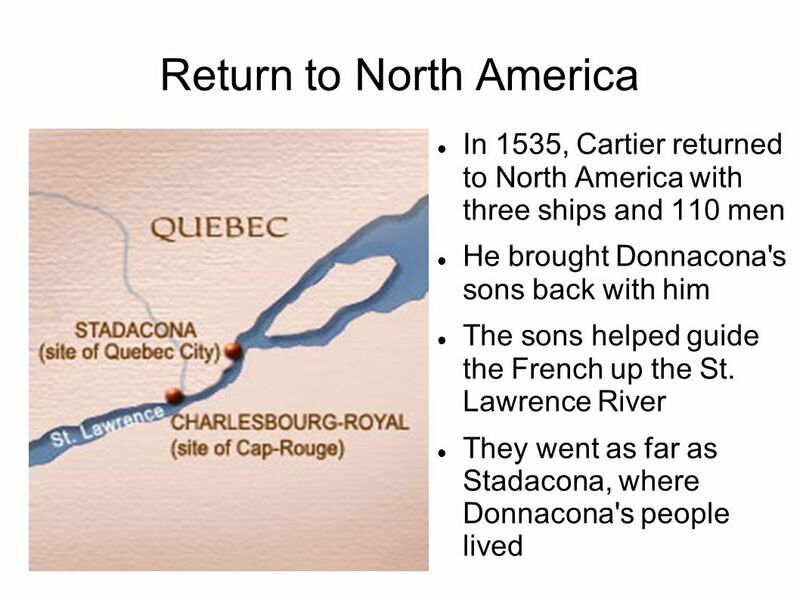 Should be at least one paragraph (3-5 sentences) Option 3: Take the role of Donnacona as Cartier raised the cross at Gaspé. 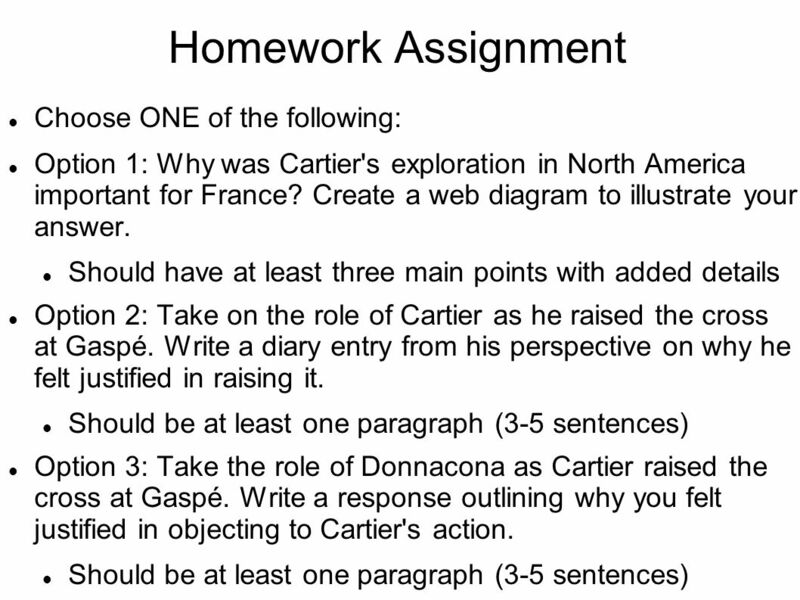 Write a response outlining why you felt justified in objecting to Cartier's action. 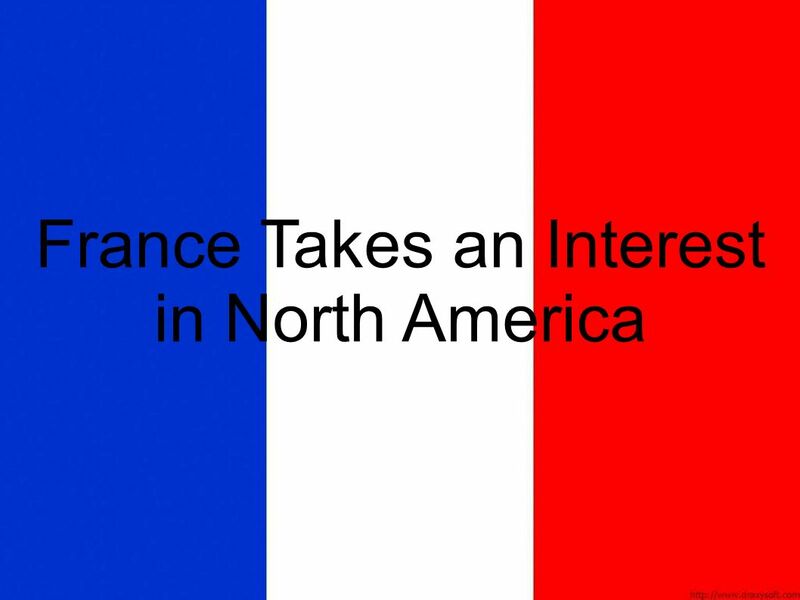 Download ppt "France Takes an Interest in North America"
Meet Jacques Cartier What country was Cartier born in and explore for? John Cabot claims Cape Breton Island for Henry VII of England: John Cabot on May 2nd 1497 set sail from Bristol England on a ship named the Mathew and. John Cabot Venice Genoa Venice Bristol. By Helen, Anna and Megan. Jacques Cartier (personal background) Jacques Cartier was a experienced sailor and navigator. In 1534 he tried to find the Northwest. The Explorers American Literature I. Giovanni da Verrazzano ( ) American Lit. 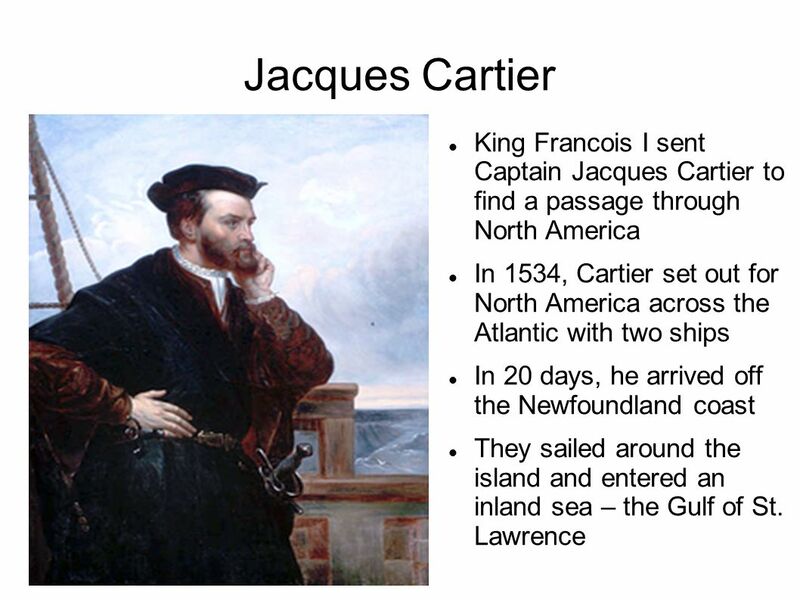 I.
Jacques cartier Jacques Cartier (1491 – September 1, 1557) was a French explorer of Breton origin who claimed what is now Canada for France. BY BRANDON WHITE.  France His Impact He changed the maps for France. I explored and mapped areas in what are now southeastern Canada and northern New York. A huge lake in New York was named after me. I also named a trading. SPANISH EXPLORATION. Spanish Colonization: Christopher Columbus  Italian Sea Captain and map maker  Wanted to sail west across the Atlantic to reach. A Northwest Passage Chapter 4: Lesson 1. 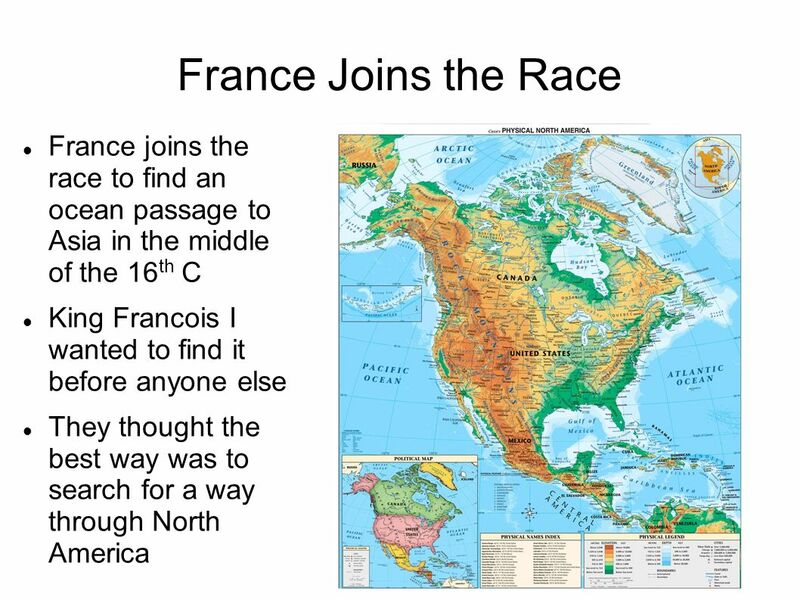 Search for the Northwest Passage Lesson 5. What about the rest of Europe? In the 1500s, Spain is the richest nation in Europe. The rest of Europe believes. A Northwest Passage Chapter 4 Lesson 1. The Story of William Penn William Penn was born October 24, 1644 in the country of England. Penn attended school until age 12. After that he had private. Canadian Explorers By: Samantha Introduction My project is about Canadian Explorers. Explorers came from Europe to the new world, North America. Some.